The first thing you'll need when you get started on a Chinese ball project is patience and determination. It takes a certain level of commitment to complete these and it usually doesn't happen in an afternoon. Many people have spent weeks or months working towards their goal. Some, unfortunately, give up before completing a ball. We're here to help make sure that doesn't happen to you. So, let's get prepared. Start out with the articles in the 'Tools & Supplies' section. These will give you a good idea of the items specific to making these projects. Read through the tutorials. Get familier with the processes. Gather the things you'll need (see below). Start with the 1-leval ball. This will get you comfortable with the chuck and ensure your cutters are setup and working properly. Once you get the 1-level ball working, follow whatever interests you. All the basic skills will be yours. Woodworking lathe. Any size will do, and the smaller ones have some advantages when working with such small projects. Hemispherical chuck. To make one, follow the tutorial here. Hollowing tools. You can make them, purchase the Crown set, or any other available set. You may need to sharpen and/or shape them before having success. Drill bits. At a minimum, you'll need a 7/8" forstner bit for a 1-level ball. See the drill bits page for lots of others you can use. Jacobs chuck for holding the drill bits. Flat tool rest. You need a flat surface to guide the hollowing tools. If you try to use your regular tool rest, it will act as a fulcrum and probably won't work very well. You can make one out of wood, build a metal one yourself, have one made, or purchase one from us. Balls. You can buy pre-made 2-1/2" spheres to start out with. I find them not very round and rather frustraiting. You might have better luck. To make them yourself, check out the links for balls and ball jigs. 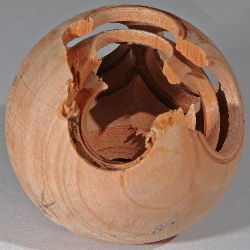 To start out by making a make a single level ball, assuming you already have a lathe, jacobs chuck, and drill bits, you can get started for about $250. That's $150 for the crown tool set (without extra handles), $50 in parts to make a chuck right and $50 for a nice tool rest. You might be able to make a chuck for less if you already have an insert or another way to hold it. And it might be possible for you to use a home made tool rest. That would put you at $150 for the crown tool set.